In front of a captive audience of trapped college students in Lynchburg, bombastic Texas Senator, Rafael Edward “Ted” Cruz, announced he was running for President of the United States. Although, judging by his divisive, narrow-minded remarks, it sounded more like he was running for president of Liberty University. The interesting thing about Cruz is that he’s not selling a set of policies or offering an innovative new platform. He doesn’t have a record of legislative accomplishment to run on either. He is essentially a professional lawmaker who doesn’t have the skill-set to pass laws. Out of 112 bills that he has sponsored or co-sponsored, only one has become law. Would anyone have noticed had he not shown up for work? The heart of what Cruz is peddling is a dreary disposition, a sullen contrarian attitude, and a perpetual sour mood. But he’s bamboozling his base by promising to “stick it to Washington,” even as this consummate creature of Washington vies for the city’s top job. “If you like straight marriage, God (the Christian kind, not one of those off-brand deities) and the good old days (circa the Revolutionary War), then I’ve got the presidential candidate for you…He is the first candidate in American history to whose primary accomplishment is forcing the U.S. government to shut down while reading “Green Eggs and Ham” by Dr. Seuss. If Cruz has a chance of winning he must capitalize on the Squirrel Strategy: Harvest the nuts. His immediate goal is to become the last extremist standing to challenge the GOP establishment candidate. A March 13-15 CNN/ORC poll shows that Cruz has some work to do. Only 4% of GOP voters would support his candidacy. The top vote getters in the poll are Jeb Bush at 16%, followed by Scott Walker at 13%, and Rand Paul at 12%. 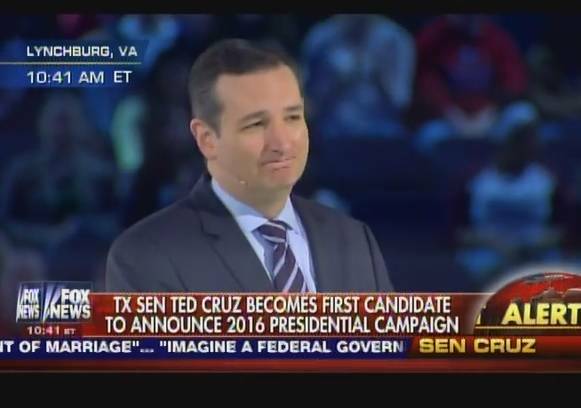 The key to an historic upset is for the nasally voiced Cruz to become the undisputed King Crackpot. Before he can take on Bush and Walker, he must take out Mike Huckabee (10%), Ben Carson (9%), Rick Perry (4%), and Bobby Jindal (1%). If voters loyal to these cranks gravitate to his campaign, he can effectively serve as a spoiler. This is much more difficult than it sounds. Cruz’ loony tune tactics have been so effective at exciting Tea Baggers that they are being aped by his competition. They are all competing for who can veer furthest to the right. Soon, they will be so far outside the mainstream that we will need a telescope to see them. Ted Cruz is no dummy. He is an Ivy League educated U.S. Senator who clerked for former Supreme Court Chief Justice William Rehnquist. He is cunning and crafty and should not be underestimated, even as his campaign announcement was underwhelming. One gets the sense, however, that Cruz and his cuckoo compatriots aren’t really auditioning for President, but for a future job as a FOX News talk show host.